That's the man we want to read about. We want to know just how he split the rails or drove the mules on the towpath, just how he printed the newspaper in the baggage-car,' just how he sneaked up into the garret and practiced on his harpsichord after his father said he would whip him if he ever caught him at it again. We think per­haps we may find out the secret of success. The recipe seems to be a very simple one: Do what you want to do as hard as ever you can, and never give up. The recipe for failure is exactly the same. The worst of it is that the most of us are not right sure what we want to do. This was not the case with Sousa. "It seems to me," he said, "that when I was three or four years old I wanted to be a musician. I don't remember of wanting to be anything else. It was not the working out of a hereditary instinct, for ours is not a musical fam­ily, so far as I know. My father was com­pelled to take up music for a living, for he was an exile, but he was not a musician. My mother had an ear for tune, but she was not a musician. She did not greatly care for it. I sang as a boy in the public schools, but not in any church choir. I did get some singing in Esputa's musical acad­emy. We sang English glees, and especially at commencements we sang four-part pieces that Esputa wrote, solfeggios, do-re-mi, and all that, you understand." Good old do-re-mi! To you how many are indebted for an insight into the real depths of tonality, an insight denied to those who begin to learn music by finding out that F is the first white key below the three black ones, the first space of the treble clef and the line with the rig-a-ma-jig on it in the bass clef. Blessed be do-re-mi through all ages of ages! "In Washington where I was born. My boyhood's home would have been literally under the shadow of the Capitol if the sun had ever taken to setting in the northwest, for our house was in G street, between Sixth and Seventh, Southeast. I was born in 1854, so you can see how old I am. It was just about ten years ago that I made my first dent in the world, after hammer­ing away for thirty-five years, the first dent that you could see. "At Esputa's I studied the violin and harmony," went on Mr. Sousa, "and did something on the cello and the slide trom­bone. I picked up a little of the baritone horn, too. I was there four years, and in that time I won five gold medals. I've got them now. I'm mighty proud of them. No decorations I could ever get could give me any bigger feeling than I had when I got those medals at Esputa's." Mr. Sousa jumped down from the desk on which he had been sitting, swinging his legs as do all the real Arcadians, no matter how high up in the world they go, and got a photograph of the pupils of the academy with Esputa in the middle and the boys and girls an about him. 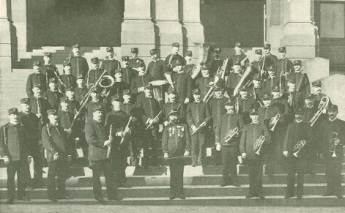 The thirteen-year-old boy at the back and left was John Philip Sousa. In the group pictures nowadays the photographer puts him in the middle foreground. Even in those days he was a professional musician. H. played the fiddle in theatre orchestras, and got engagements for dances and dancing schools. It requires no great strain of the imagination to figure to one's self the social gulf that yawned between the children that clod-hopped through the waltz, and the dark-faced, bright-eyed boy that fiddled away at his one-two-three for them to learn by. One needs only to know children to understand how contemptuous the little snobs can be to another child not so well-dressed, one that actually has to work for a living. What do you suppose would have happened if the Sousa boy had presumed to recognize any of those superior beings if he met them on the street? It may be good sport to go to a dance, but it is not sport at all to play for one, to keep at it till the dawn peeps in at the win­dow before you strike up "Home, Sweet Home." The dark-faced, bright-eyed boy took the money thus earned and spent it for violin lessons from George Felix Benkert. "Ah! he was a fine man! A great teach­er!" he says now, but you don't hear him. You are thinking of the boy stumbling along home, dead for sleep, through the empty streets in the early morning, with the birds in the trees just waking up and chattering about how they slept last night, the milk-wagons rattling along, dissipated cats slink­ing home ashamed of themselves, policemen yawning through the dog-watch and very lonely. The boy is tired, and his eyes are full of sand, but he has hold of his money, and he thinks of the lesson it will buy, the lesson that will set him one step further on his way that will help him to be that grand being, a musician. We sort of like that boy. He is our kind of people; he belongs to our lodge, so to speak. We are glad he has succeeded, almost as glad as if it had been our­selves. One day about that time the circus came to Washington and showed in a vacant lot about a block from the house. John Philip was in the little front parlor with his fiddle, digging away at his exercises, scrambling up and down the scale, minding his bowing and making his left wrist waggle like the first violinist at the theatre when he plays Lange's "Flower Song." A knock came at the front door and the man that entered told John Philip that he was passing by, and, hearing him play, ventured to call. (Arca­dians do not stand and wait for formal pres­entations to their countrymen.) Did the boy know anything about band instruments? Oh, yes; he could play the baritone horn and the slide trombone. "Well," the man hesitated and hunched his chair over a little nearer, "how would you like to travel with the show?" "Yes," said the man, speaking rather quietly, "I'm the leader of the circus band, and if you think you'd like to try it, why I'd pay you $12 a week, and you could play, a horn in the band and a violin in the or­chestra." Why John Philip Sousa's heart did not then and there burst his ribs has never been explained. What would his father say, though? There was hardly any need to ask that. It was sure to be, "No." "Oh, well," said the band leader, "you needn't say anything about it. Just keep still, and to-morrow night, when we strike the tents, you be on hand. Come and stand right by me. Then after you're gone you can write to your folks and tell 'em where you are. What do you say?" How easy it is to prom­ise to keep a secret; h o w difficult to keep it when it is as big as this. There was a boy next door, a playmate of John Philip's. "If I tell you some­thing, will you promise, cross your heart, hope to die if you ever tell a living soul? Well—say now, don't you tell anybody. Well—Oh, if you do, now! Well, I'm going with the circus!" "Get out!" "I am so! The bandmaster asked me to go and play in his band." "Over the left he did!" The boy next door was finally convinced, and was filled with envious admiration. The burden laid upon him was greater than he could bear. He told his mother the secret, and—mothers have no sense of honor in such matters—she went right with it to Mrs. Sousa, and she told her husband. The next morning was the day the circus was to leave town. The boy walked in a day-dream. That night, when the tents were struck, he was to go with the show! He was to travel and see wonderful things, to be in the midst of wonderful things. He would have a lot of money, and, best of all, he was to play music every day. "After breakfast my father told me to go put on my Sunday clothes—we had Sunday clothes in those days, if you remember," said Mr. Sousa, "and he marched me down to the Marine Barracks and enlisted me as apprentice boy in the band. That was the last of the circus for me. I couldn't run off without getting Uncle Sam after me, even if I had wanted to disgrace myself and dishonor my flag by becoming a deserter, I guess it was just as well for me. I stayed in the ser­vice eighteen months, and then I got out and was leader in orchestras at the different theatres. I went on the road with various theatrical organizations. Milton Nobles was the first man I was with. Don't you remem­ber the old 'Phoenix,' with its, 'And the villain still pursued her'? Yes, sir; I was with Milton Nobles, and a fine man he is. The play was first called, 'The Witches of New York,' later it was, 'Bohemians and Detectives,' and last of all, 'The Phoenix.' I wrote an overture to it, and a Jim Bludsoe march, and all the incidental music. I went with various fly-by-night organizations until Offenbach came to this country in '76, with the nucleus of an orchestra, and then I played with his first violins. I went out in comic opera, with the Church Choir 'Pina­fore' Company, and after that I was asked to become the leader of the Marine Band, in which I had been an apprentice boy. I stayed with that twelve years, and I look back with grateful eyes upon that period. It has given me an absolute love for the Marine Corps from the oldest commandant to the youngest junior officer. Many was the kind word of encouragement I got from them, and I can­not forget it now. Then in '92 I made two tours with the Marine Band with great suc­cess." "When did you begin to write music?" "When I was eleven years old." "Have you kept any of your youthful compositions?" "No." Mr. Sousa said this as if he won­dered how anybody could be so foolish as to ask such a question. Indeed, what author can show his first schoolboy essay on The Horse, beginning with the enunciation of that great truth: "The Horse is a noble animal." It must be the same with a com­poser. "No, they're all lost. Even when I did know how to write anything worthwhile somebody would ask me. 'What's this?' ‘Oh, a little andante or a scherzo,' or what­ever it was. 'Give it to me.' All right, take it along.' Not long ago I got a letter from a Boston publishing house saying that in looking over some old manuscripts they found two compositions of mine. I am posi­tive I never sent them anything. Maybe someone did to whom I gave the pieces." The old topic opened up, the hard time the man without a name has to get a hear­ing. According to Mr. Sousa, it is just as discouraging in the musical world as it is in the literary or artistic. "It is almost impos­sible," he said, "for the new man to get recognition. It has been so from time im­memorial; it will be so till time shall be no more. And yet the world is hunting eagerly for men with new ideas who will paint them the old familiar scenes in such a way as to make them seem new pictures, for they make the people feel their charm anew; men who will tell them the old stories in a way that will make them seem real, and men that will sing tunes that will stir their hearts. When the world finds such a man it gives him enormous success in return for his efforts to please. The world doesn't care a pin for his name; it cares only for what he can do to please. Of course, if a man writes a novel that touches the heart at the same time that it carries conviction, creates the illusion, we all look for his next book with pleased anticipation. It may be that he has only one story to tell. Then the world goes on and leaves him. He must have something more to say than mere prattle. The suc­cessful man must have more than one picture, one story or one tune in him. "If he has, recognition will come, if he will wait. But we can't wait. It is ter­rible to have to wait. But it's got to be, that's all there is about it. We must do the best work we can and wait till the time comes. Nobody appreciates better than I do how hard it is to do this. I have felt it as much as any man in the world. I've been through it. "The first piece I ever had published I paid for. It cost me $25, and that $25 was a great deal of money to me; an awful lot. Of course, the piece did not sell. Some friends of mine with a great big gob of kindness in their hearts bought copies. I think about $4 worth. But the rest of the world, though it was hunting new tunes, paid no attention to the publication of my piece. It had not found me yet, and the fact that I was disappointed in the sale of my music did not disarrange its machinery in the least. The next time I thought I would try Philadelphia. I went up to the publish­ing house of Lee & Walker and showed my two compositions to the editor, with whom I struck up a friendship that has lasted ever since that day, and that was in 1872, when I was eighteen years old. He played over my pieces and they sounded beautiful. He was a good pianist, and I never have been. He made some kind of a cabalistic mark on them; I suppose it meant 0. K., and sent me down to see Mr. Lee. Mr. Lee liked the pieces, but I was a young man, an absolutely unknown young man, and all that you know what they all say. Still the pieces were very nice, and they would publish them, giving me, I held my breath—giving me one hundred copies of each piece. My railroad fare from Washington to Philadel­phia and return and my hotel bill amounted to about $15, and for that I was to get one hundred copies of each of my two pieces, which would cost the publisher perhaps $7. I thought that was pretty hard. But I accepted. I supposed that the music would be printed off right away. It wasn't. After about a dozen letters from me during a period of six or seven months, I finally got word that they might get the piece out the following quarter." "Now that you have made a hit, don't those pieces sell?" Mr. Sousa shook his head and pressed his lips together. "The world does not turn back and look for what it has once passed by. It wants something new. "After a while I sold my compositions for what I could get, anything from $5 up to $25. The 'Washington Post March' and the 'High School Cadet March' I sold for $35 each. They made an independent fortune for the publisher, Coleman, of Phila­delphia." "And all you got out of them was $70?" Mr. Sousa nodded. He did not seem to feel bad about it. He seemed to think it was a kind of a joke on him, of course, but a good joke for all that. Probably he believes that there are more marches just as good where they came from. Probably he has got over grieving about it in the last ten years. "Did those two pieces that made the hit seem to you when you wrote them to be better than your other tunes?" "I always think the piece I have just finished is the best I've ever done. My children laugh about it. They say, 'Papa's last piece is the best because he says so.' The march I have just finished for the Fourth of July at the Paris Ex­position I like better than anything yet, but a friend of mine to whom I played it said he guessed he'd have to hear it a few times. I like my pieces. I always stop and listen to them when I hear them on a street piano." Doesn't that go right to the heart? Of course an Arcadian likes his work, and thinks it the finest in the world. Otherwise he would not have done it. Sometimes he pretends to be modest, and calls it a poor thing, but then we all know it is only a pre­tense, or else he is a half-breed and not a full-blooded Arcadian. "Here, that's not the right tempo. It goes much faster. Like this," and he turned the crank himself quite briskly. "Who are you?" demanded the street piano man. 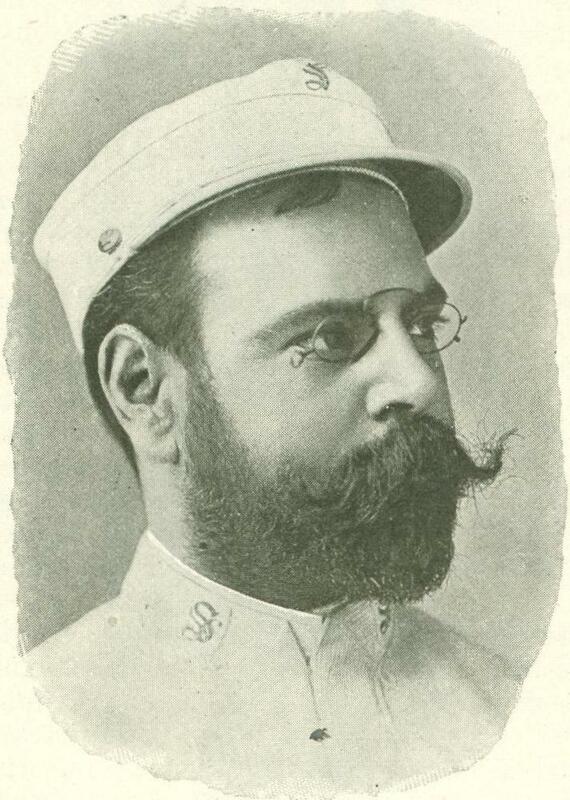 "I'm Sousa, the man that wrote the piece." "No," said Mr. Sousa, "that's the inven­tion of a clever press agent." (What a mer­ciless creature Truth is! She won't let anything hap­pen as it ought to if she can possibly help it.) "I did go up to the first man I heard play the 'Washing­ton Post March' on the street and talked to and told him I wrote the music, and gave him some money, but all the rest of it was made up." He said this as if he were a little embarrassed. He need not have been. We can all understand per­fectly just how good it made him feel to hear his music on a street piano for the first time. That proved to him that other people had at last found out what he had always known, that he "heard in his soul the music of wonderful melodies." It has to be a good tune to grind well. And, oh! how proud is the moment when the world first approves, and the artist can say: "Anch' io son pittore!" "I am not one of those who believe that what the masses like is only the trashy and the trivial. Listen to the street organs and you will find that they play the music of the great masters. You hear the 'Wedding March' out of ‘Lohengrin’ and the 'Torea­dor's Song' from 'Carmen,' and the like of that. I went the other evening to the circus which has to appeal to the popular taste, it must be sure to please everybody. One of the most popular of the pieces that the band played was a pot-pourri from Wagner's operas. Wagner's music in the open-air con­certs in the parks always gets loud applause. If I were to set out to educate the masses to love music I believe I would begin with Wagner. I know he would gain their inter­est from the start. He is so dramatic. I am glad the people like my marches just as they like the Strauss waltzes. Somebody told me once that a wooden-legged man could keep step with a Sousa march." Speaking of those clever fellows who can take a tune like "Annie Rooney" and treat it in the style of Wagner, Beethoven, Mey­erbeer, Rossini and Mozart, Mr. Sousa said: "They put it in the style of the best-known pieces of those composers. Myself I am very bad imitator. In the opening of the second act of an opera of mine I was ad­vised to give it a Spanish coloring. I wrote it so. It was sung only three times. If I had hypnotized myself till I was in a Spanish atmosphere, and could only think in Spanish terms, I might have composed something worthwhile, but to do it deliberately - No, it was an imitation; it was manufac­tured stuff, and it failed, as it ought. The musical composer, or the writer, or the painter cannot do good work to order to fit certain require­ments. He must do what he has to do as he feels it. So far, they are all alike; but the musician must seek his best expression in exactly the opposite direction from the writer or the painter." "Well, if you paint a picture you must lay on the colors so as to make the spectator think that he is looking into a forest. He knows he is not, but the painter must create the illu­sion that he is. If you write a story you must make the peo­ple talk and act as they would if they really lived. The reader knows that people do not talk so in real life, but the writer must create the il­lusion. You must mimic nature. But the musician must get as far away from nature as possible. I could blindfold you and then with seven drums in the next room could give a perfect imitation of thunder. But it would not be music; it would be a noise. With a cup of water and a tin whistle, the sweetest song of nightingale or mocking bird can be outrivaled. But suppose I should do that on the stage of the Metropolitan Opera House. The people would laugh, and pretty soon they would get angry and the least they would do after that would be to go to the box-office and demand their money back. "In literature, painting, sculpture, the dramatic art, a man is great as he preserves the illusion as he appeals to the intellect to verify his imitation of nature. Music, on the other hand, appeals almost wholly to the physical in man, much in the same way as eating and drinking--"
This interview was had just the day be­fore Sousa and his band sailed for Europe. Interruptions were constant for one thing or another that had to be decided upon at the instant. The worst of this interruption was that Mr. Sousa never did get the time to explain in detail his theory of the way music affects the soul. Perhaps he really could not have enlightened the world a great deal. It would be a little too much to expect him to be a first-class psy­chologist. He can make good tunes, and that is enough for one man to do. But if he cannot give psychologists a solu­tion, he can, at least, give them a problem. He has the sense of absolute pitch. Let any instrument in his band sound any tone and he can tell what it is. That state­ment will not hold good if it is a band that uses higher -pitched instruments, for there is not an A that is for all time and eternity an A and nothing else, although Mr. Sousa holds that there are only two ex­act studies in the world, music and mathe­matics. "Twice two will be four to the end of time," says he, "and the chord of 3-5 will always be the same through all ages of ages." If there were a standard pitch to which all adhered, Mr. Sousa could tell what tone it was that any instrument played, and he can tell if he knows how much sharper or flatter the pitch of the instrument is than the pitch of his band. Some people do this with their own pianos, particularly if it is not a very good piano, so that certain notes have a special timbre of their own, on account of the hammer felt being a little worn or one string being a little out of tune with its fellow. Others mentally gauge the tone by the compass of their voice, but Mr. Sousa says he does not think of his voice. Not only is this son of Arcadia a writer of pretty tunes; he is also a good band conductor, which is a talent on the same line as being a good general, only about ten times more difficult. It is no fool's job to direct an organization of fifty men when they are all highly paid, thoroughly com­petent musicians, virtuosos on their particular instruments. Consider, then, what it must be to make a fine concert organization out of enlisted men receiving $13 a month. Some directors use quite plain language at rehearsals; some even go so far as to humiliate publicly a performer making a mis­take at a concert. The band men say that Mr. Sousa never does anything to hurt their feelings. If an error is made at rehearsal, it is called at once, but no abuse goes with it. In the profes­sion it is considered something remarkable that he is able to lick a new band into shape so soon, to give them their cues and to make new men understand his signals in so short a time, particularly as he has a way of conducting that is differ­ent from other men, and has a set of poses and gestures for each piece. 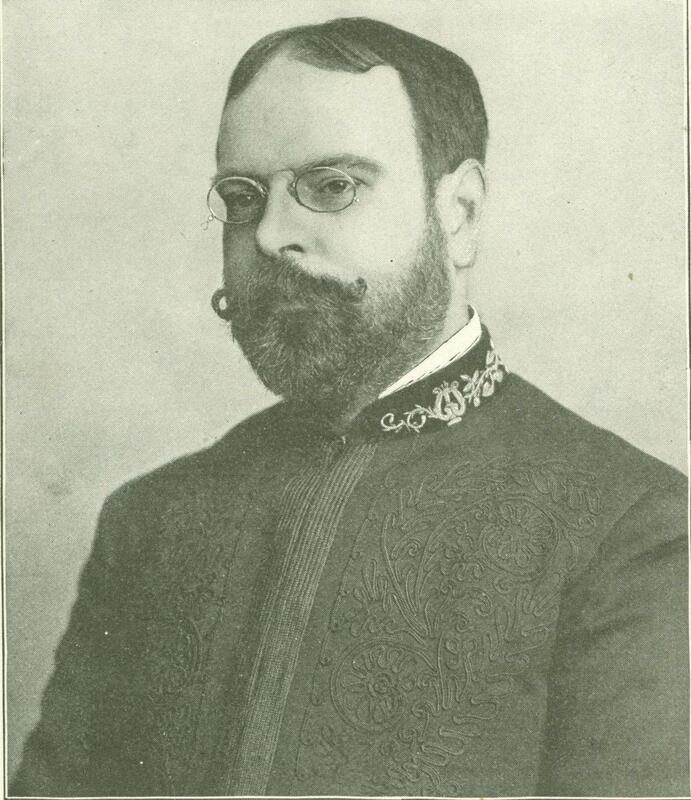 All honor is to be given to Patrick Sarsfield Gilmore as the great man who made it possible for the military band to live as a concert organiza­tion by so increasing the clarionets, which correspond to the violins in an orchestra, as to enable orchestral works to be put on the military band, but John Philip Sousa has taken hold where Gilmore left off and has climbed to greater heights. Sousa's band is a purely concert organization; it never marches. Look over its roster, and while there are names there undoubtedly German. French and Italian, there are plenty of others as frankly American as a cornfield. As a means of livelihood the band men do not come quite so near starvation as the prophets of their town probably foretold when the boys started out. Salaries in the season range from $40 a week up to $150 a week and more. Of course, that is not as much as railroad presidents make, but it is likely that the band men have a good deal more pleasure out of life than the railroad presidents do. And did you notice this, that as soon as Mr. Sousa reached the "Washington Post March" period of his life he had no more auto­biographical reminiscences? 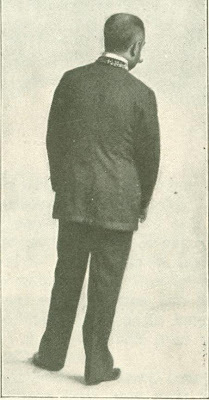 Life should be interesting to him now; he lives at the Netherland Hotel, which is very comfortable indeed; he performs at the Metropoli­tan Opera House, which stands tolerably high among the theatres of the country; his band is to play at the Paris Exposition. Why should he not talk about his later life? Because he is an Arcadian, and so knows what is dramatic and what is not. See that man running for a car. He yells, he whistles on his fingers, he waves his umbrella. Per­haps some of the sympathetic pedestrians help him. They halloo: "Hay! hay, there! Conductor!" The women lean out of the windows; the children stop their games. The car goes bumping along, the silly conductor dreaming as he leans against the dashboard. But by-and-by even his ear detects a noise; even his eye observes a commotion. He turns, sees the man, gives the motorman the bell to stop and pulls the passenger aboard. All interest in the man that ran after the car ceases. The women take in their heads; the children resume their quarrel where they left off; the pedes­trians mind their own affairs. They are glad if they helped to call the conductor's atten­tion, but they don't care to know that now the man is sitting down, now he is wiping his forehead, now he says to the conductor: "Why didn't you stop when I hollered at you?" now be gives the conductor a dime, and the conductor gives him back a nickel and rings up the fare. They are satisfied to know that it must be all right with him now that he has caught the ear. Mr. Sousa may be said to have caught the car. From Ainslee’s Magazine, July 1900.